Posted on November 12, 2014 by J. There are three bad onstage habits that actors are inclined to have, with regard to movement: Telephone Booth Syndrome, Cat’s Feet, and Wanderlust. “Habits” is perhaps too hard-hitting a word. Actors aren’t aware they are doing any of these things until it’s brought to their attention. These seem to just be natural behaviors that many, and perhaps most, actors are inclined to exhibit until they learn how to NOT do them. If they are such bad choices on stage, then why do actors do them? Don’t know for sure, but I’ve got some hypotheses: Fear. The inability to pay attention to too many concurrent activities (talking, listening, emoting, moving). Fear. A conviction that saying one’s lines is the primary, overriding concern. Fear. Whatever the cause, I find that when I bring it to an actor’s attention, he will usually understand why it isn’t the best choice available to him and why it doesn’t reflect real life. However, the ease with which he can learn to overcome it and use movement effectively varies from person to person. Nevertheless, I believe that everyone can, because after all, it IS something we do quite naturally in real life. Funny how difficult it seems to be to do on stage what we do so naturally the rest of the time, huh? So what are these three habits, in brief? The first is Telephone Booth Syndrome. 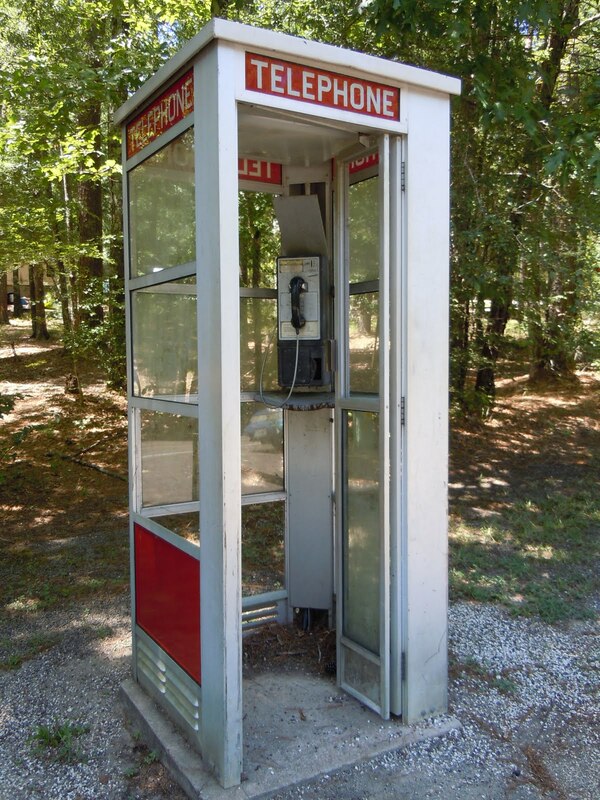 For those of you too young to remember them, telephone booths were narrow, four-walled spaces designed for privacy for making a phone call from a public phone. (Yes, once upon a time we didn’t care to conduct personal business while walking down the street!) Even with one shoulder against a wall, it was impossible to fully extend one’s other arm. Actors with Telephone Booth Syndrome act if they are similarly restricted. They are inclined to remain rooted to one spot (trapped in the confines of the booth), and the idea of using gestures which would violate the dimensions of their invisible booth is unthinkable. Their upper arms tend to remain in contact with their torso, while the lower arm does all the necessary pointing. For these actors, holding their arms out to the side, parallel to the ground, in a gesture that is inclusive, encompassing the world and all its possibilities, is nearly impossible. It’s fascinating to me that while these actors will take direction and move from Point A to Point B when the director asks them to, asking them to exercise the freedom to fling their arms wide as a reflection of a line that says something about “the whole wide world” causes them to panic. They try to oblige, but their elbows are still distinctly bent. They THINK they’re responding to the direction, but they aren’t, and it’s massively uncomfortable for some of them to go to full extension. But imagine, if you will, five actors standing on stage, each in their own little telephone booth. How dynamic or interesting is that to watch? Telephone Booth Syndrome is perfectly understandable, because it is our “personal space”. By personal space, I mean the area around us that we prefer other people to not enter. You know the stranger you just met at a party who gets uncomfortably close to you, invading your personal space? Well, it seems that not only do we not like others to invade our personal space, we don’t really want to leave our space ourselves (at least, not when we’re on stage)! But the rules are different on stage! Knocking down the personal space walls is essential. Actors need to feel the freedom to let their emotions run amuck.